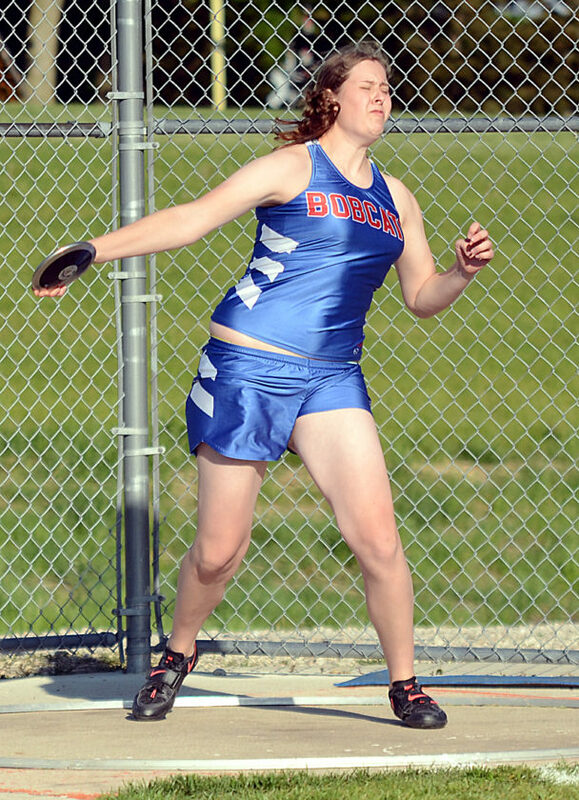 T-R PHOTO BY STEPHEN KOENIGSFELD • Malory Henze launches the discus in one of her throws Thursday at the Class 4A District 1 qualifying meet at Ames High School. Henze threw for 117 feet, 3 inches, to take second place and automatically qualify for the state track and field meet next weekend. 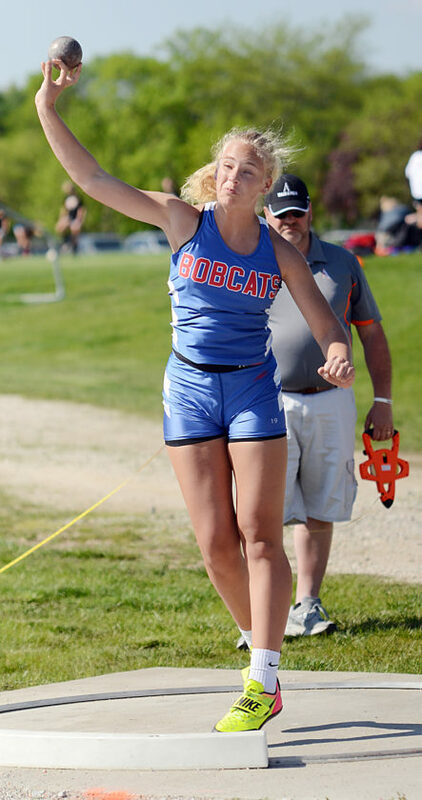 AMES — Malory Henze stepped to the front of the discus circle and gazed out over the tree tops, donning a big, bright smile that reflected more than six years of throwing that dang disc. The smile vanished and she retreated to the back, began to spin and let the saucer fly — 117 feet, 3 inches to be exact. 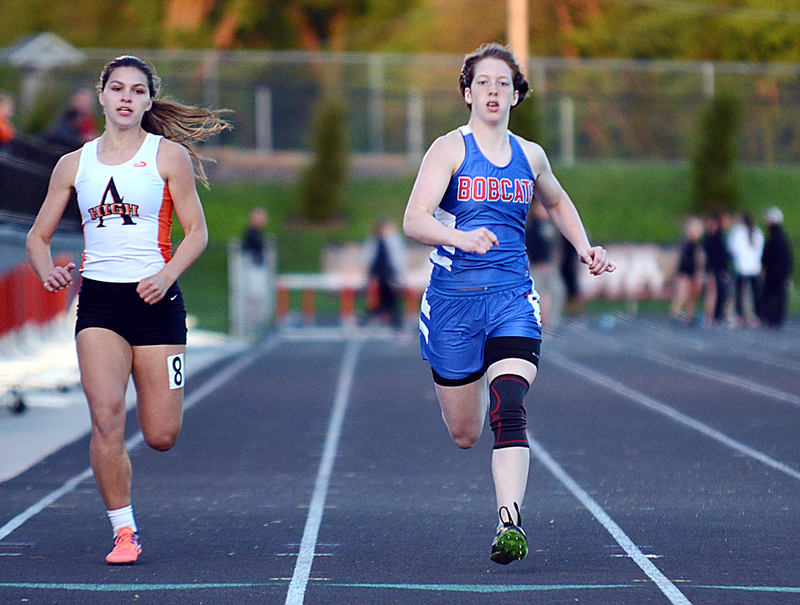 It was enough to earn her second place at the Class 4A District 1 meet, automatically qualifying her for the girls’ track and field championships next weekend in Des Moines. But it took a few seconds for that statement, an achievement she’d been working toward since the seventh grade, to really sink in. She retreated from the discus ring, heard her score aloud — her third and final throw of finals — and walked back to her coaches like she had 100 other times this season. “It’s fine. I’m going to state, so …” she said, realizing at that moment the gravity of her accomplishment. That’s when the tears started to flow and the hugs and high fives and handshakes went around. T-R PHOTO BY STEPHEN KOENIGSFELD • Maddux Richardson lets go of the shot put during one of his rounds at Thursday night’s Class 4A District 1 meet in Ames. Richardson won the event with a throw of 54 feet, 6 1/2 inches, to be crowned the district champion. Henze has a season best of 125-4 1/2, set last week at the CIML Iowa Conference meet in Des Moines. And like any athlete striving to beat their best mark, Henze wanted more from herself at the state-qualifying meet. She wanted to win. Mason City’s Katrina Cornick, who hadn’t thrown all year because of a torn ACL, competed in her first meet of the year, going for 117-10 and winning the event. She, too, burst into tears and hugged teammate Carly Seeck when the scorekeeper read her score. Henze said she knew it was going to be a fight with her, and said she’ll be even more prepared to toe the same circle with her next weekend at Drake Stadium when the two will face off again. As a team, the Marshalltown girls had one of their best meets to date. 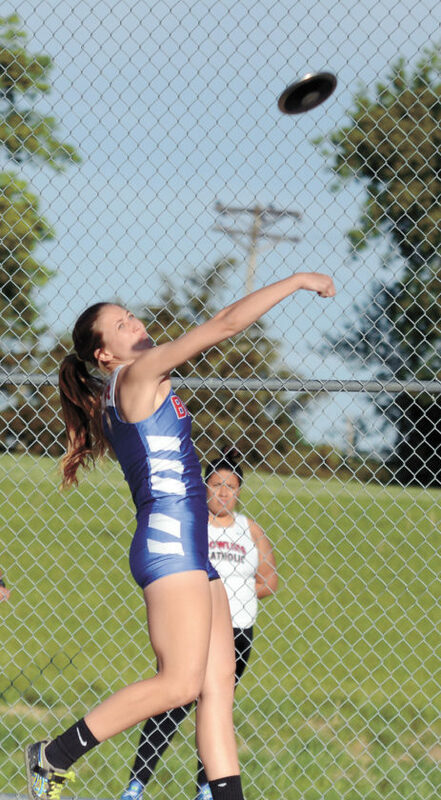 They took sixth out of eight teams with 51 points, and head coach Chad Pietig said Henze’s performance and accomplishment highlighted and showcased what the Marshalltown track and field program is about. Henze took an unorthodox approach, throwing from a standing power stance that got her into the finals with a throw of 111 feet her first time in the ring yesterday. From there, she built her speed and spin, making sure to keep her throws in bounds, as much as she could. It’s been three years since Marshalltown has been represented at the girls’ state track and field meet. Samantha Hughes was the last to make trip, Henze’s sophomore year. Fast-forward two more years and now Henze will be in the same shoes. She scavenged for the words to describe the feeling. Discus teammate Jill Podhajsky took fourth with a throw of 103 feet, and has a chance to make one of the next 12 best throws among all qualifying sites. Should she make the top 24, she, too, will be making a trip to Des Moines. The Bobcats are also holding onto hope for 200-meter runner Kierra Gardner. The freshman took sixth in a time of 27.28, however, the 200 field in Ames was collectively one of the fastest among all qualifying sites. Full state qualifying results will be released later today on the Iowa High School Athletic Association’s and Iowa Girls’ High School Athletic Union’s websites. Maddux Richardson, who has been cracking the 55-plus-feet barriers for most of the season, added another accolade to a storied senior season: District Champion. The senior shot putter threw for 54-6 1/2 to win the shot put event, but it was more of a bittersweet feeling. After struggling with some chest issues, Richardson has regressed a bit in the latter part of his season. 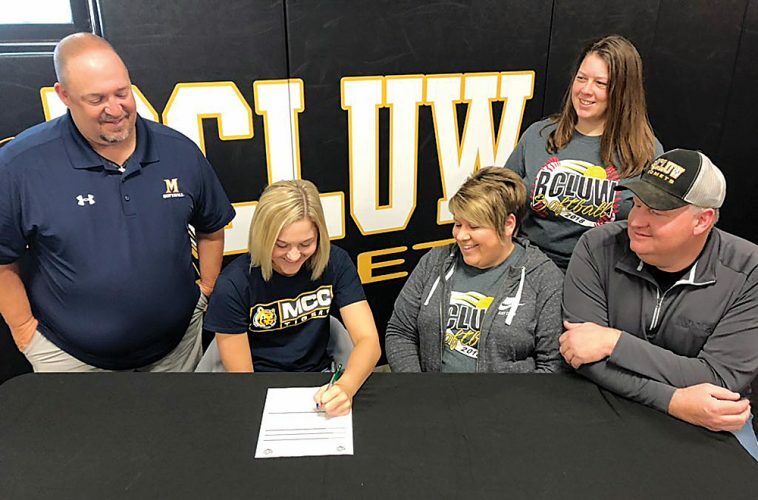 And after breaking the Marshalltown school record and becoming one of six throwers across all classes to throw 60-plus feet (60-4), Richardson admitted to wanting to get back to that mark sooner rather than later. 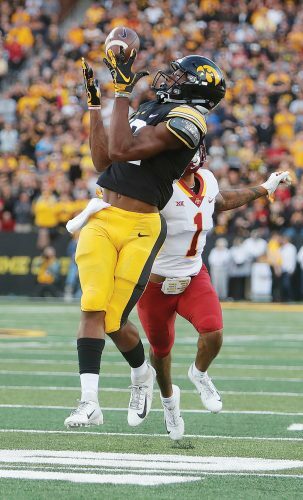 Despite not being in his best shape, Richardson gave a lot of his district title credit to his coaches who helped him prepare for the situation he’d be in yesterday. As much as he might’ve wanted to fight back the smile, he couldn’t as he recounted the fact being dubbed district champion is one of the top birthday presents he could’ve asked for. Richardson turned 18 years old Thursday. MHS head coach Doug Bacon said he was happy for Richardson to have three to six more throws in the shot put at the state meet, but is certainly focused and relieved to have his leading hurler almost back to full health again. “It’s great that he gets to get back,” Bacon said. “But I think it was a little bit of a frustration because he had one throw out there that was about 56 [feet] or so, and couldn’t quite hold it in [and faulted]. I think for the most part he’s pain free and that’s the main concern right now. Obviously, you’re going to have a little frustration when you don’t throw as well as you want to throw. 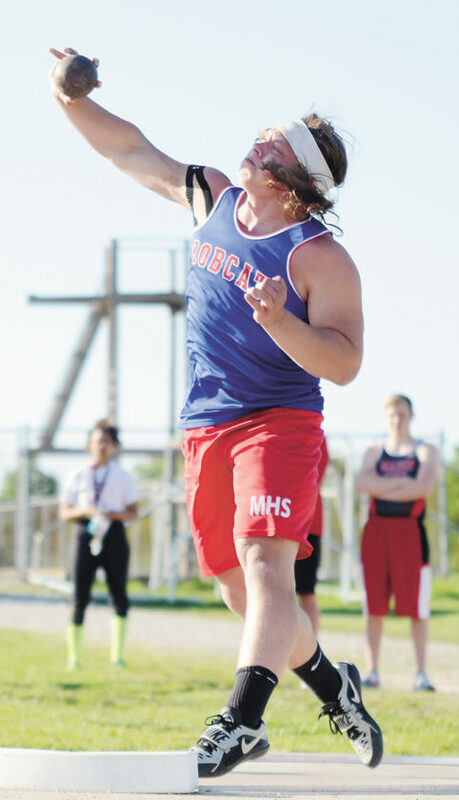 Bacon said he hopes that by seeing Henze and Richardson achieving state-qualifying honors this year, that Marshalltown athletes alike can get back to the norm of being regular participants on the state’s grandest stages. The boys’ and girls’ state meets will take place Thursday through Saturday at Drake Stadium in Des Moines. CONTRIBUTED PHOTO • The Marshalltown girls’ golf team shot a season-best score of 360 on Thursday at the Southeast Polk Invite at Copper Creek Golf Club in Pleasant Hill, earning second place in the process. Pictured, from left, are Kassy Vest, Bella Russell, Emily Vest, Emily Hass, Lauren Propp and Ciara Feldman. T-R PHOTO BY ROSS THEDE • Marshalltown senior Sean McWilliams makes a backhand return on the run during doubles play at the Class 2A district boys’ tennis tournament Thursday at the MHS Tennis Courts. McWilliams and Luke McKibben won this first-round match in three sets, 3-6, 6-3, 6-3, against Dane Hurst and Parker McNally from Waterloo West.